Being able to fly opposes the force of gravity, which defines physicality; being able to overcome fear opposes the power of death to limit our sense of immortality. Some rare people refuse to be subject to any external power, rejecting even death and physical limitation as insurmountable constraints; to them Mind is paramount. 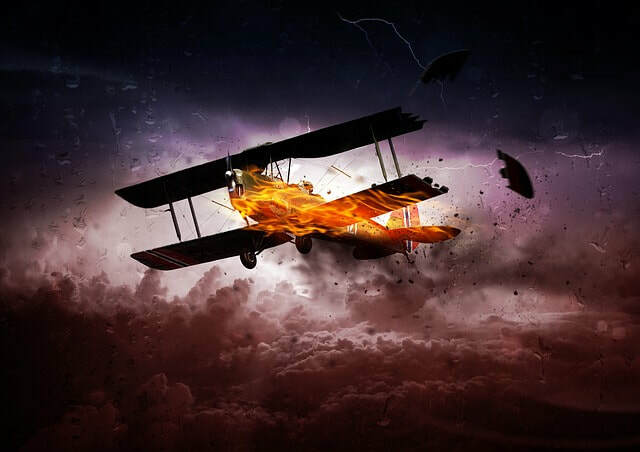 An aeroplane falling is a symbol of being out of control and in great danger. This is similar to the unspoken fear that society propagates in order to dissuade powerful individuals from taking their freedom. For the true seeker, this propaganda has its worth as an agency through which the self can re-orientate its direction. Celtic spirituality honours the stag, the boar and the salmon because they go against the flow. When we are doubtful about our next spiritual step, here is the clue – go against society. Like the salmon, we must plunge into all experience passionately. We have to use a crisis to our advantage and re-establish conscious self-control. Following the direction of the herd is not entirely invalid during easy times, but when crisis comes, then if we can, we must take command. If we are disinclined to lift a finger in an emergency we will be caught up in a rapid collective descent into jeopardy. We must assume that, since we are required to be heroic to survive, then we are in fact heroes in the making. Some of us have not lost the sense of existential wellness. When in the right state, nothing whatsoever can befall us other than scenarios and situations appropriate for our best interests. We will even find a way to right a falling aircraft, as long as we trust that we can and pull out all the stops. However, we can courageously choose to disregard the consequences, actual and potential, when we are in right relationship with the soul. Danger of death, and death itself, are not significant disturbances to the realised being.